Beautiful updated 3 bedroom home. This home has 2 living areas and a large backyard. Freshly painted, it is ready for immediate move in! Comforts include: large fenced backyard, central a/c and heat, attached double-car garage, large walk-in closet in master bedroom, large kitchen and two large living areas. This is a good home with three nice sized bedrooms and two bathrooms. The dining room opens to the living room; creating a great area for entertaining guest. The large fenced in backyard doubles as both a private area; great for family barbeques or the perfect playground setting. 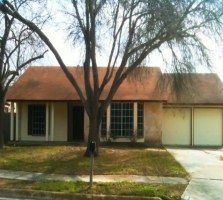 This home is perfectly situated in close proximity to Randolph Air Force Base and Ft. Sam Houston. *MILITARY DISCOUNT please call for price. More pictures are available upon request.